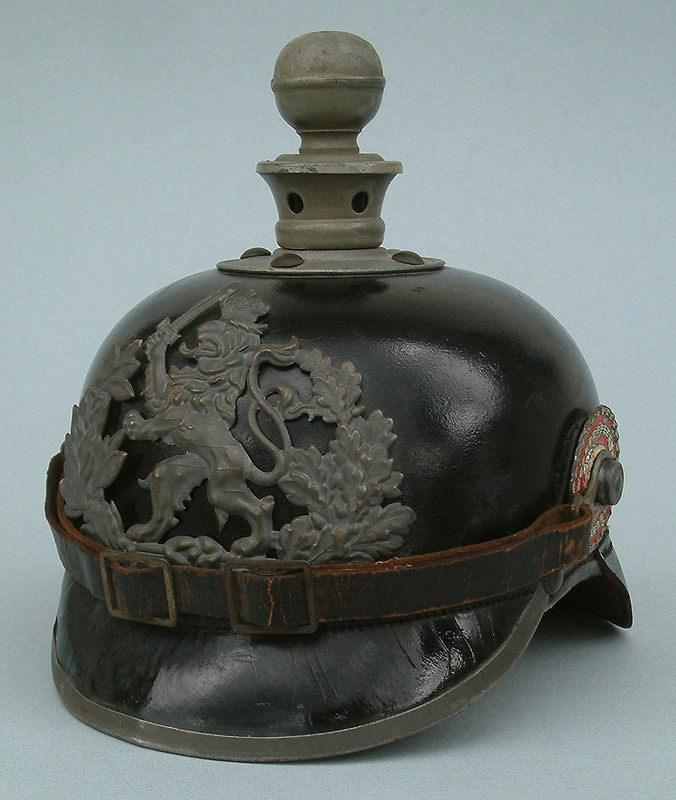 Larry: For further comparison here is another IR115 helmet made by Martin Mayer, Mainz, in 1915. Excellent helmets all round gentlemen. I am wondering, are all the 115 OR's helmets shown here on the forum the type where only the tip of the spike screws off? The one that I have in my collection is like that. Is this typical of OR 115 helmets or are there variations? I have a Hessen reserve officer hemet with brass fittings where the spike tip and collar screw down over the neck of the spike fitting. More like a traditional Prussian spike. R1 your OR 115 helme seems to have the spike tip and collar type of top on it. 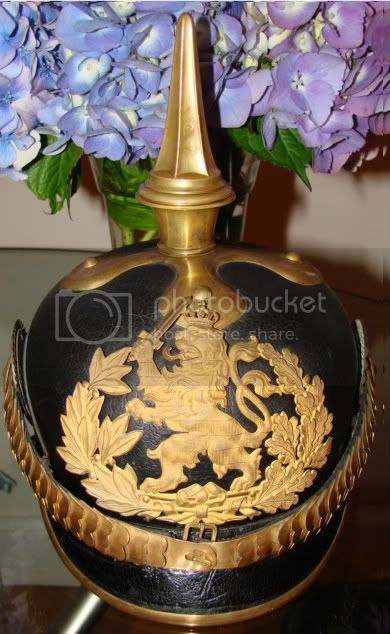 b.loree wrote: And, how about the Hessen dragoon helmet spikes?? That's an excellent idea regarding a Hessen database, but instead of making it an addendum to this discussion, it should start life as a Sticky in "Pickelhaube discussion" (as things quickly get buried unless they're headliners). R1 your OR 115 helme seems to have the spike tip and collar type of top on it. Brian: The screw off spike on my 115th helmet has an intergral collar. It is also interesting to note the differences in the position of the "1621" bandeau on the four samples illustrated. My helmet and Larry's have the bandeau mounted such that it sits on top of the foward arm of the spike base. Tony's and Bruno's helmets have the bandeau positioned under the front arm of the cross base. Good point, R1. The same applies to the IR115 Filzhelm. 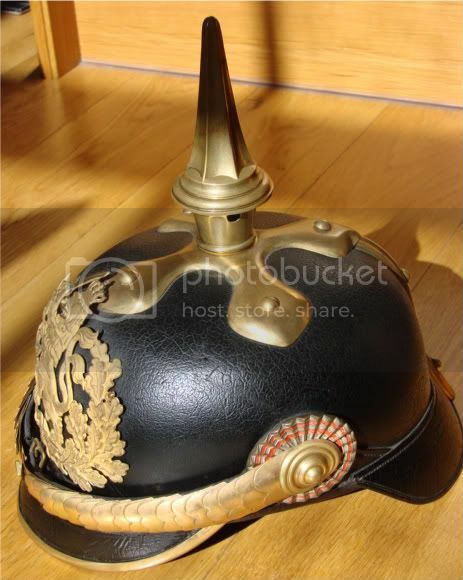 All the hessian infantry EM helmets I own - white or yellow fittings - have only the tip of the spike screwing off. All the officer helmets - white or yellow - have the more classic unscrewable spike with the "skirt". As far as bandeau and spike top go, the images speak for themselves. The helme also has the typical large spike support disc on the inside. Since we're on the subject of spikes for Hessian helmets, here's a spike that came off a Prussian M15 EM helmet. I assume this was a post-war mis-match, but wondered if this would have been used on a Hessian helmet? 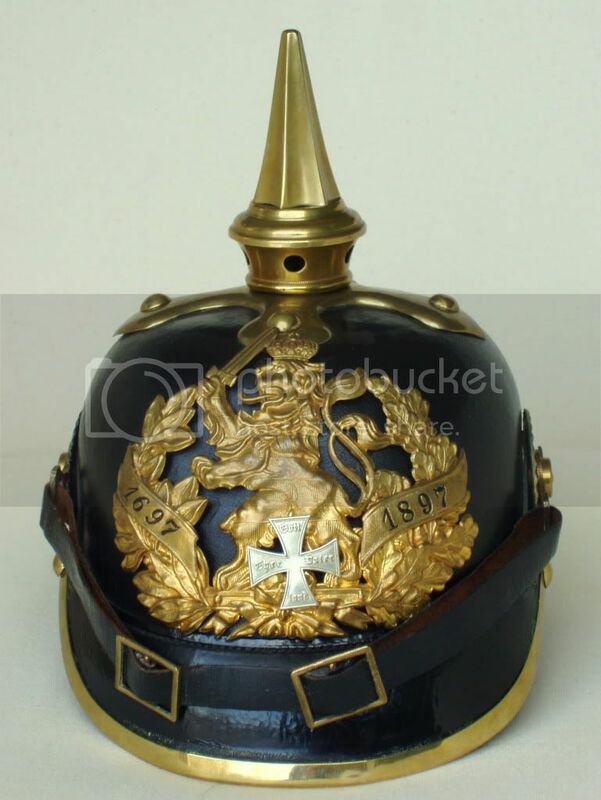 A Bavarian helmet? Both? 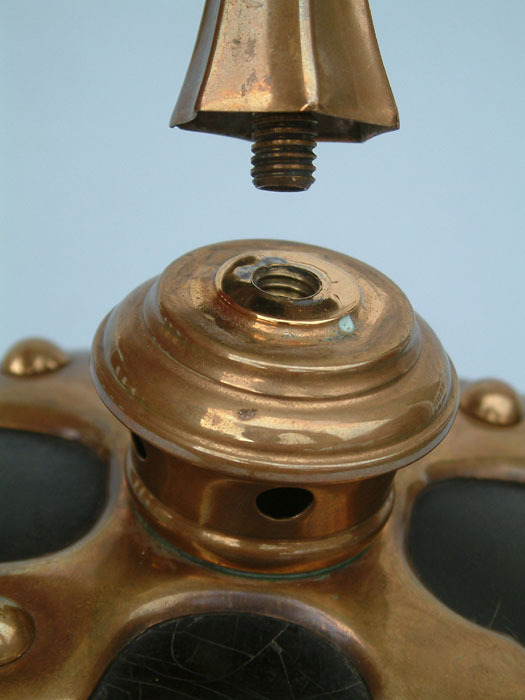 Would the spike base have been round or cruciform? Looks like a Hessen M15 spike top to me Mark. Check out the spikes in the examples here. Looks the same to my eyes. I dont think that it is Bavarian. Last edited by b.loree on Thu Sep 23, 2010 11:04 pm, edited 1 time in total. The spike definitely has the configuration associated with Hessian infantry and dragoon helmets, all of which would have cross bases. 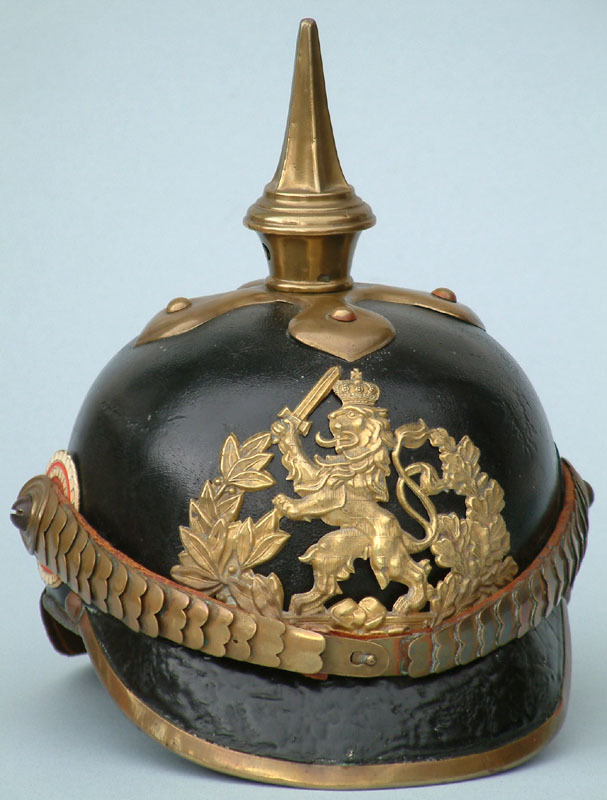 Other M15 helmets using cross bases and fluted spikes of somewhat different configuration are Bavarian Chevauleger, Schwere Reiter, Field Artillery, Mecklenburg Grenadier Regiment 89 and Mecklenburg Fusilier Regiment 90. Take a look at The Kaiser's Bunker as Tony has a very good illustration of an M15 Bavarian helmet wiith fluted spike/cross base. Last edited by reservist1 on Fri Sep 10, 2010 6:54 pm, edited 1 time in total. 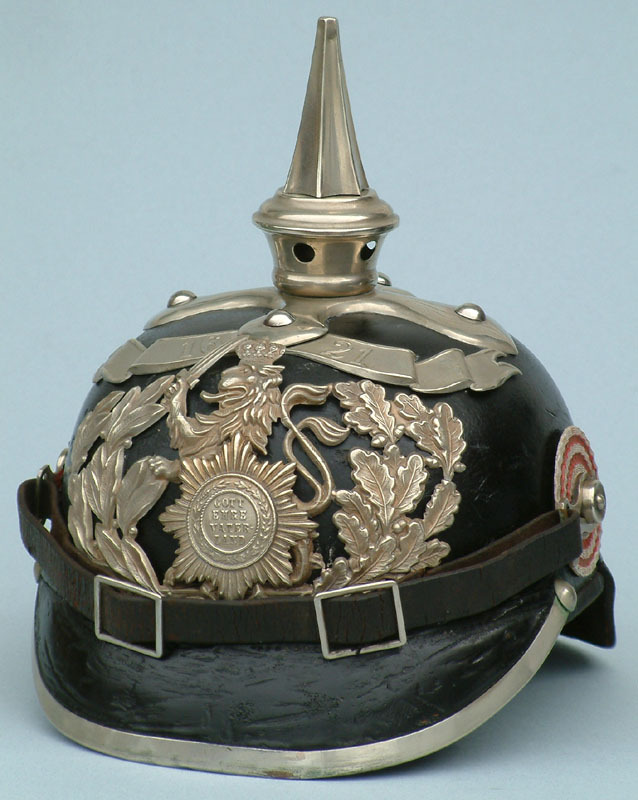 Kokardes for other ranks Hessian helmets seem to exist in two styles, silver plated bodies with red painted rings and white painted bodies with red painted rings. For those owners of Hessian silver trim helmets, IR 115, DR 23 and DR 24, is the Hessian kokarde on your helmet silver/red or white/red? 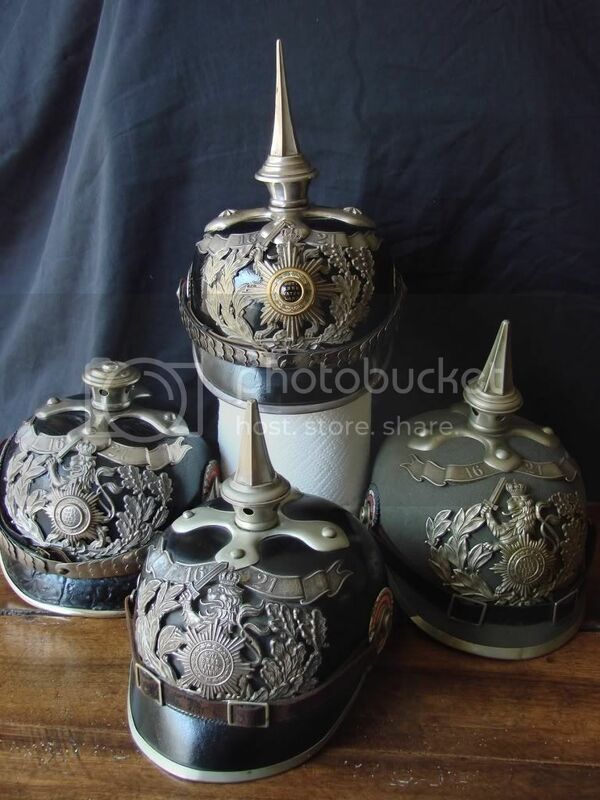 There have always been questions whether the silver kokardes were issue items for all silver trim helmets, just IR 115 or were they private purchase? Obviously, as kokardes were easily replaceable parts, both during the official use period of the helmets and in the many years of subsequent "collector manipulations", it may be difficult to determine if the silver/red kokardes were issue items for particular Hessian helmets. Last edited by Adler on Tue Oct 28, 2014 5:14 am, edited 1 time in total. Beautiful, Adler. Here is the EM model. And here is a JR115 Unteroffizier helmet. Great helme R1 reminds me of of my JR116 helmet which I shall post a pic of shortly. Some pics of my JR116 helme. 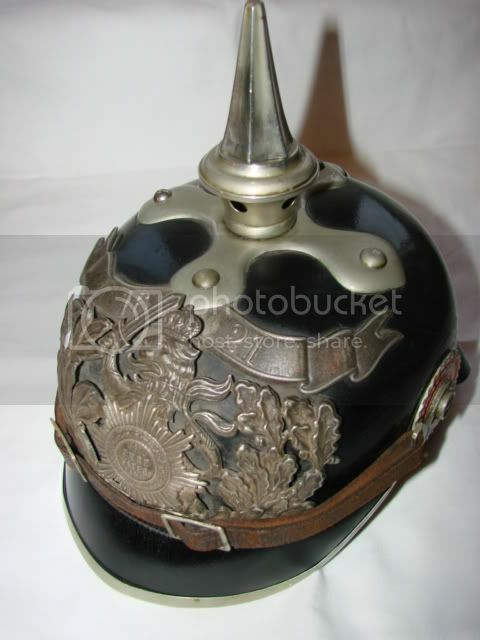 Obviously a pre 1891 helme that was equippped with the new M91 side posts. I love these older helmets with the higher domes and heavier gauge of leather. In general, they seem to survive the passage of time in better condition. This helmet was purchased from a Butterfield & Butterfield Auction in San Fran years ago in the 90,s. Some of you older collectors may have bid on items from that fabulous collection of Napoleonic, and Imperial German items. I know Randy and Tony C. did. Chin strap is obviously a repro. 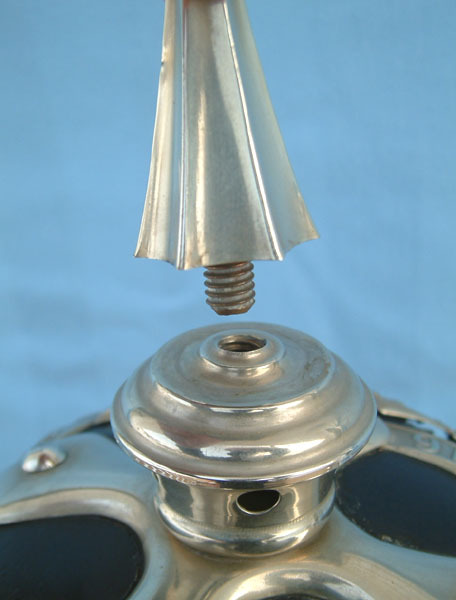 Spike top does not unscrew. Given this huge collection of JR 115 helmets–does anyone have a unit mark I can put into the listing? We do not have one. Thanks to Tony we now have one! Last edited by Adler on Tue Oct 28, 2014 5:11 am, edited 1 time in total. Super helmets Rurik. I love the chinscales on the ORs helme. Wish mine had come with those! Great helmets. Thanks to all of you. Yes, Rurik, we should meet, but not at Kube's auction this week-end. And here is the JR115 "Konvolut" I already showed on the forum. I was hoping that you would post that group shot again 911, very nice indeed. Very few collectors would have such a grouping of 115s, excellent. 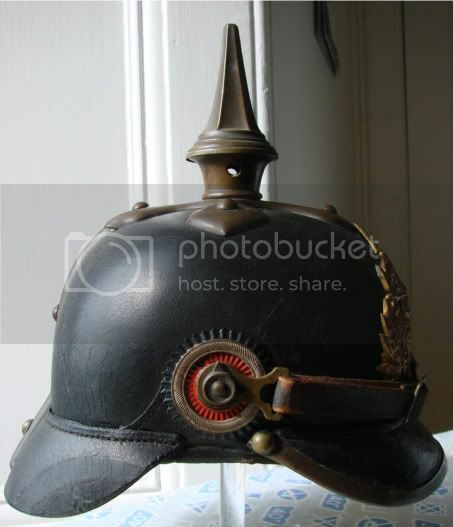 And a lateral view of the Hessian Train helmet (TB25) I recently found and showed on the forum. It is obviously a pre-1891 model that was revamped. Compare with Brian's JR116 helmet above. 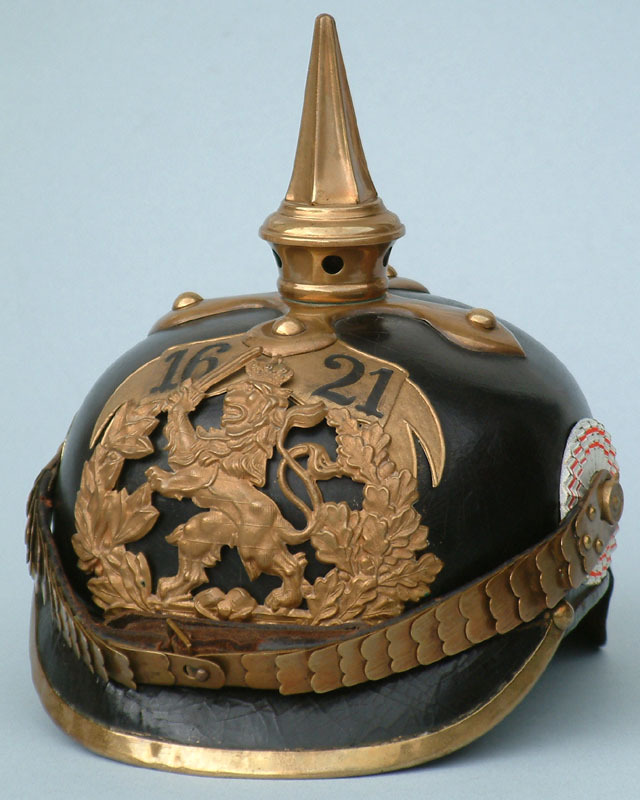 A lot of great hessian helmets gentlemen! Last edited by Adler on Tue Oct 28, 2014 5:18 am, edited 1 time in total. Hi Adler, beautiful helmet, beautiful frosting on that wappen. I am wondering if those scales and fittings are German silver due to the darkening of the metal? 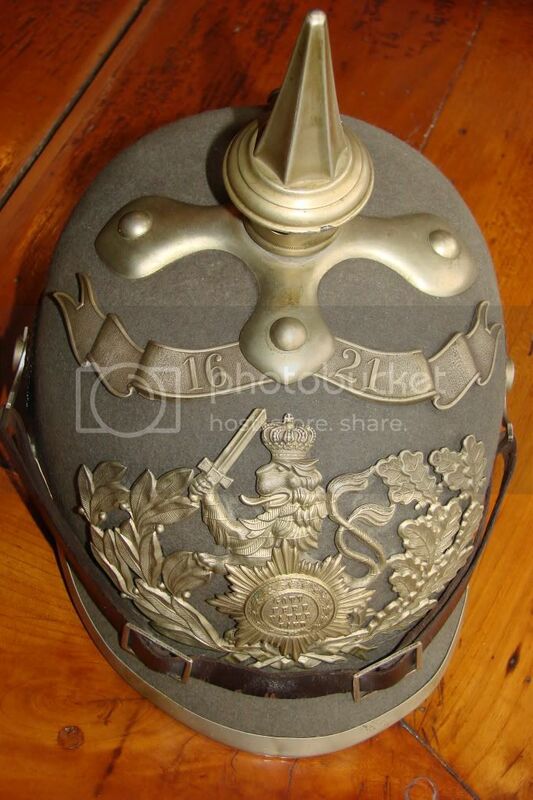 My Oldenburg dragoon officer helmets' spike is stamped 08 under the spike base and it tarnishes very quickly. I have only polished it once when I first got it. 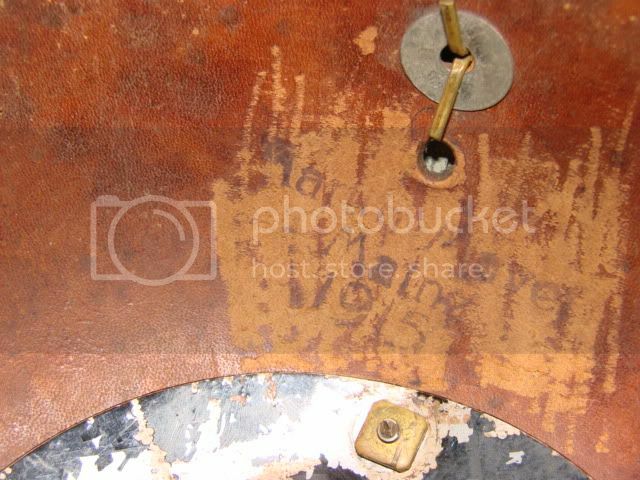 Does anyone out there have a leather M15 from JR115 or the other Hessen Regts, ? I guess I could post my Hessen M15 with round spike base again, but I feel guilty as I have not fixed the depressed top of the shell as yet. We have seen some great filz helmes so bring on the M15s! still no M15 from JR115 mit bandeau. I wonder if such a helmet exists?? One of my Ml 15 has inside a label with 115 marking. May be other photos this everning. Woohoo... M15's a gogo! Now I definately have to go and hunt for those beauties! I am wondering if those scales and fittings are German silver due to the darkening of the metal? Update: When I bought this trichter I wasn't sure if it was correct for my helmet having never seen one. Now I'm pretty sure it's correct. The EM trichters were not fluted like the officer versions. Also... 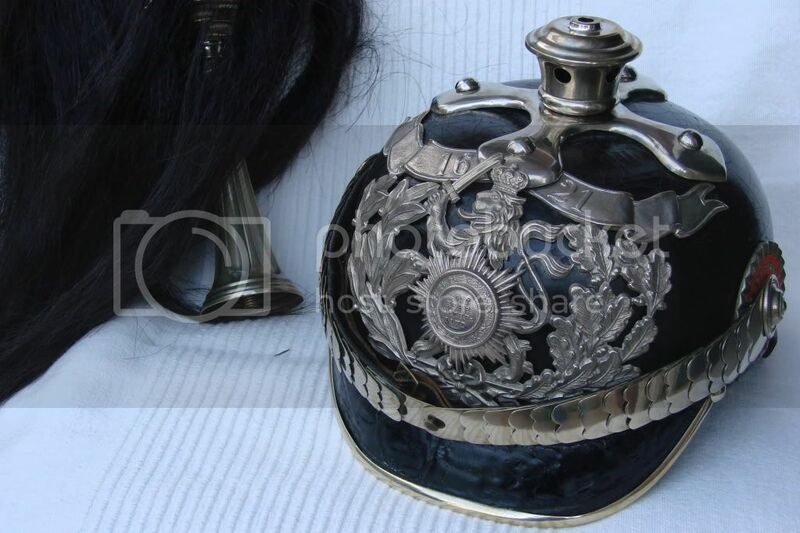 Does anybody know who bought the Hessian IR115 pickelhaube shell from Advance Guard Militaria? I was bummed to have missed that as it would have greatly simplified my restoration project. I might have some parts to help with the restoration of that helmet. Last edited by Maple Creek on Thu Oct 21, 2010 7:53 pm, edited 2 times in total.